Yes if you think you can come here and overthrow our government. No, you don`t understand. We Serbians will only give a little push. I mean, even fact that are Serbs against Duda would be enough to ruin that clown. And ask Hungarians, too. Czechs, Slovaks. Duda have such a fine way to ridicule us all, to avoid interests of Central Europe and he isolates Poland. For whom Duda works? For France? For whom? Man, Duda is utter moron and utter traitor. Yep but more of a symbol nowadays, the skill to use this was passed from farther to son, I am probably the last in our family to maintain the tradition which goes back to the 17th century. I am probably the last in our family to maintain the tradition which goes back to the 17th century. Son is fine but don`t be sexist brate wurste. .you need a son, pronto! The last thing I would want to teach my son is the mechanics of combat and warfare, this all needs to end with my generation. What are you talking about? That is crazy talk. IF you really posses some 17th century saber skills you should pass them on. Sorry, but I doubt that you do. Man, Ana Brnabic has more pride then you do man. Its a dragon woman. Not perfect woman (not at all) but dragon woman in any case. Sorry ironside maybe you and your family were behind the iron curtain, these things were frowned upon. I also learned Fencing at our polish club in the uk. ah, so you're talking about fencing not some 17th polish fencing - got you now. well, that is of little use on today battlefields. these things were frowned upon. not shooting, one could improve his shooting skills in his free time all right, learning basic in school, and coscripted into commie army, only declared commies could 'own' a gun. Yes fencing was a sport but the szabla was the main weapon of every Polish cavalryman, my grandfather used this weapon against the Bolsheviks he taught my father (But dad never had one at casino) then dad taught me. I'd say that Dolno is on topic because this is a thread about Polish independence which therefore encompasses Polish identity and culture. 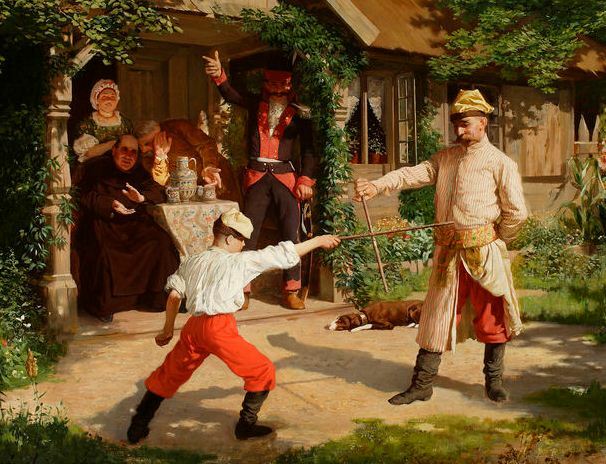 The art of using a sword was very much part of that right into the 20th century but like so many true Polish traditions it's been largely lost. Ironside's comments demonstrate the ignorance of even a middle aged Polish person about some aspects of Polish identity. So when people march on 11 November what are they celebrating exactly, what does it mean to be Polish as opposed to French or German or Russian? @Dolno, Mr Atch's grandfather was also in the cavalry but obviously a later generation than your own grandpa. Mr Atch's granny still has his cavalry sword. Did I ever tell you the tale of the rat?? When Mr Atch was a baby his grandparents were 'minding' him as we'd say in Ireland and granny put him out in the garden in a sort of Moses basket to get the fresh air and sunshine. Apparently a rat came along and was sitting on his chest. Grandpa ran into the house, grabbed his sword from the wall, rushed back to the garden and decapitated the rat where it sat. Cue outburst of hysteria from Granny 'you old fool, etc' :)) But such was the skill and precision of a Polish swordsman. Apparently "the combat traditions of Polish cavalry are continued by the armoured (Kawaleria Pancerna) and aeromobile (Kawaleria Powietrzna) units of Polish Land Forces. " But I bet you won't see them at the Polish Independence Day March and they should be, in my opinion. You're missing the point. 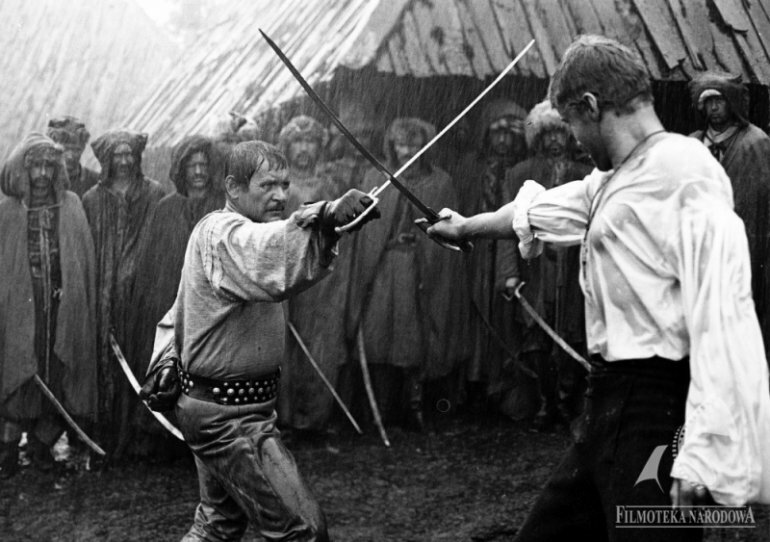 Swordsmanship was not frowned upon because it was a form of combat skill but because it was an old Polish tradition associated with the nobility and the Commies didn't like that. Look at how hard they worked to wipe out the Polish officer class and intelligentsia. They tried to do the same thing to Poland as they did to Russia. A kind of genocide. Kill them or force them into exile. It was the Commies who disbanded the Polish Cavalry. Wow Atch I am so impressed a non Pole was the only one to see the connection,I expected many poles here (including the mod) would connect to my post and know how the polish cavalryman was pivotal in the the war of independence. you only have to see the art of the time that portrayed the Polish Szabla cutting down the Bolshevik swine. No the commies did not want us to carry on our traditions and remind them how we once were able to defend ourselves against them and gain our independence. But yes the tradition Foil and Szabla were very much a part of the officer class and nobility. Well don Grandpa , glad Mr Atch remembered the story and the significance of this tradition. Am I? It is not the right thread nor the right time to talk about some obsolete issue. I was talking about the old Polish Art of Cross Cutting as dolno said/wrote something about 17th century. Cavalrymen taught to use saber and lance before the war are not the same thing. It's precisely the sort of thing that should be discussed on a Polish forum. It's a beautiful art at which Poland excelled, it's powerfully symbolic even in 21st century Poland. It's your history, not some obsoloete issue and it's far more worthy of discussion than the rubbish that's often talked here. However it requires some interest in the subject and either some knowledge or the will to acquire it, which comparatively few members of the forum posess. Cavalrymen taught to use saber and lance before the war are not the same thing. They stem from the same tradition. @ Dolno, something for you below! President Duda has said that he will not participate in the Independence March in Warsaw this year. - I would like us to go together in the Independence March, and it is a matter of responsibility to society. Let's stand side by side and show people that we can be together. We do not have to bite ourselves - president Andrzej Duda said in a Friday interview for Rzeczpospolita. Many people took these words as the president's invitation to the march organized by the nationalists. However, according to the RMF FM radio station, the president himself will not take part in this demonstration. President, or a government was never a part of Independence March initiative. It was always organized by a National Movement committee right from the beginning. It's a grassroots movement and that's what makes it so great. So I don't see any controversy here. It's a grassroots movement and that's what makes it so great. You mean it's actually a yearly gathering of football ultras in Warsaw. Nothing 'grassroots' about it, it's just the one day a year when they get together. I would like us to go together in the Independence March, and it is a matter of responsibility to society. Duda is a clown to say such a thing. Just as the communist government stated before the May-day processions. So I don't see any controversy here. Duda will bunker down in Jurata more like. If his helicopter comes over Dougpol towers I will get on the roof and offer him the finger. Last Wednesday, the conference of the organizers of the Independence March took place. The head of the initiative, Robert Bąkowicz, said that the 100th anniversary of regaining independence by Poland is "a moment in which we Poles should unite and not divide". - Despite the fact that some political differences divide us, despite the fact that there are situations in which we are in a very strong political dispute, we would like to invite President Andrzej Duda - added Bąkowicz. He explained that the organizers want the president to speak at the beginning of the March. According to the information provided by the media, talks between the Chancellery of the President and the organizers of the March of Independence continued for some time. According to the media, the Chancellery wanted a guarantee that the only symbols that would appear on it would only white and red colors. Apparently, such a guarantee could not be obtained. The president will not take part in this demonstration once again. Such a guarantee is impossible on a march on this scale. And anyone can join it since it is open for everyone. Hence the provocations from opposing groups has happened in the past. According to the media, the Chancellery wanted a guarantee that the only symbols that would appear on it would only white and red colors. Which seems reasonable enough. Clearly the organisers didn't want to abandon their symbols. Spike being as you are 100 percent Yorkshire let me describe this rally - imagine all the top boys from Leeds, Sheffield We'd, Sheffield United and whatever other struggling teams you have there meet up for a day and instead of fighting each other they drink together and sing songs about Tommy Robinson. They spend precisely zero time thinking about the independence movements. One can only wonder why Spike keeps posting pictures from completely unrelated occasions.